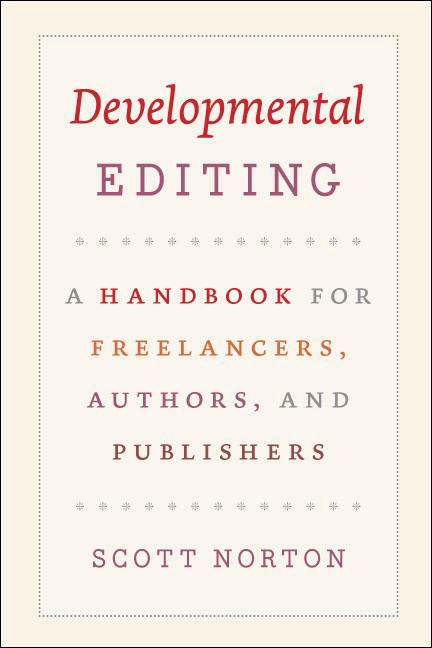 “Most of us,” writes Scott Norton in his introduction, “enter into book publishing with a romantic idea of the Editor that matches the equally inaccurate notion of the Author as tortured genius.” As it turns out, editing—especially developmental editing—is hardly romantic. It’s a tricky business, requiring analytical flair and creative panache, the patience of a saint and the vision of a writer. And, of course, the occasional magic trick: Norton can transform a stack of paper into a bestseller, or, at the very least, a book that edifies, enlightens, and entertains. In Developmental Editing Norton shares his knowledge with the rest of us. Using a series of humorous and relevant “case studies” (election-year polemic, travel guide, even a memoir), he explores the tough work of a developmental editor. From creating content to establishing authorial style, finding the “hook” and editing for pace, sizing up clients and learning when (and how) to sweat the details—Developmental Editing is filled with useful tips for editors, first-time authors, or anyone who fancies themselves a writer. Read the press release. See the author’s website. . . .
“This author is giving me a fit.” “I wish that I could just DEMAND the use of the serial comma at all times.” “My author wants his preface to come at the end of the book. This just seems ridiculous to me. I mean, it’s not a post-face.” Each year, writers submit over three thousand grammar and style questions to the Q&A page at The Chicago Manual of Style Online—and one woman, Carol Fisher Saller, reads every single one of them. These writer-editor standoffs are classic, hilarious—and, as Saller points out in her new book, all too common. In The Subversive Copy Editor, Saller asks her readers to become “subversive” in two ways: one, by rethinking their understanding of the author as the enemy, and two, by keeping in mind that it’s okay to break the rules sometimes (like when it benefits the reader). In one chapter, Saller takes on the difficult author, in another she speaks to writers themselves. Throughout, she includes useful tips for prioritizing work, freelancing effectively, organizing computer files, and writing the perfect e-mail. Saller’s fresh emphasis on negotiation and flexibility will surprise many of us who have absorbed—along with the dos and don’ts of our . . .
Perhaps you can remember those halcyon days when the rules of style and grammar ingrained in us by our school teachers offered a reliable framework for writing, and a concrete set of rules to follow when approaching the work of others. But if you can remember that far back, you can also remember how that sense of order and justice was inevitably crushed as one ventured into the grammatical complexities and gray areas of reality. Navigating the diverse and dynamic world of the English language has presented many a writer with a difficult challenge. The copy editor is the writer’s guide through the pitfalls and minefields of language. 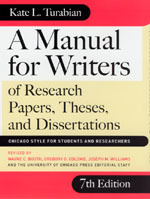 Among the best of these is Carol Fisher Saller, who’s tough yet tolerant approach—both in her career as senior manuscript editor at the press and as the wit behind the Chicago Style Q&A—has improved writers and editors alike. Now, with The Subversive Copy Editor: Advice from Chicago (or, How to Negotiate Good Relationships with Your Writers, Your Colleagues, and Yourself), Saller offers her guidance and knowledge in book form, tailored to all those frazzled wordsmiths in need of more than just a guide to grammar, but a guide to a life working . . .
It’s National Grammar Day, brought to you by the fine folks at the Society for the Promotion of Good Grammar, and, as you prepare for a raucous celebration tonight (just don’t drink too many grammartinis or you may be commatose tomorrow! *rimshot*), we wanted to spotlight a book that will help you embody SPOGG’s mission of speaking well, writing well, and helping others do the same. After all, as publisher of The Chicago Manual of Style, we take good grammar very seriously. The A in response to all those Qs on The Chicago Manual of Style Online, Carol Fisher Saller is the gatekeeper of good grammar. 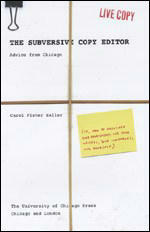 In The Subversive Copy Editor: Advice from Chicago (or, How to Negotiate Good Relationships with Your Writers, Your Colleagues, and Yourself), Saller offers a practical guide to being a prose perfectionist in a world of dangling prepositions and misplaced modifiers. A companion to grammar stylebooks, The Subversive Copy Editor emphasizes habits of carefulness, transparency, and flexibility while encouraging anybody who works with words to build an environment of trust, cooperation, and, of course, good grammar. Full of good humor, good advice, and, most of all, good writing, Saller’s wry and refreshing tome is the . . .
From this month’s Chicago Style Q&A: Q. “The first of which is better.” I said this is a sentence fragment, but a student pointed out that it has a subject and predicate. Who’s correct? A. You both are. A sentence fragment can have a subject and predicate, but it’s a fragment if it’s dependent on another clause. Your fragment can’t stand alone grammatically; it needs a main clause to lean on: “The choice is between a hamantash and a latke, the first of which is better.” Thus, with an emphasis on negotiation and flexibility, Carol Fisher Saller, assistant managing editor at the University of Chicago Press and the unfailing wit behind the Chicago Manual of Style Q&A, has established herself as a subversive exception to the stereotype of the manuscript-editor-as-quibbler. And now, as Jennifer Balderama has noted in a recent appreciation for the New York Time‘s Paper Cuts blog, with her newly released book The Subversive Copy Editor: Advice from Chicago (or, How to Negotiate Good Relationships with Your Writers, Your Colleagues, and Yourself) Saller takes the next big step in advancing her mission to revolutionize the way people think about the dialectic of manuscript editing. From the Paper Cuts . . .
With universities across the country slashing budgets and implementing hiring freezes, the job market for many PhDs seems to be, as the Chronicle of Higher Education recently put it, cloudy. But our career guides can serve as sturdy life rafts in this storm of bad news. 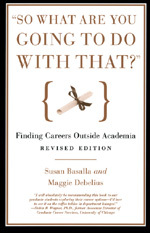 Susan Basalla and Maggie Debelius’s “So What Are You Going to Do with That?”, for example, covers topics ranging from career counseling to interview etiquette to translating skills learned in the academy into terms an employer can understand and appreciate. A witty, accessible guide full of concrete advice for anyone contemplating the jump from scholarship to the outside world, “So What Are You Going to Do with That?” is packed with examples and stories from real people who have successfully made this daunting—but potentially rewarding—transition. Taking a more specific approach, The Chicago Guide to Landing a Job in Academic Biology is designed to help students and post-docs navigate the tricky terrain of an academic job search—from the first year of a graduate program to the final negotiations of a job offer. In the process, it covers everything from how to pack an overnight bag without wrinkling a suit to selecting the right job to . . . The stock market goes up, the stock market goes down. Presidents are elected, impeached, and succeeded. The world we know is transient. One of the less-transient things in the world is the Chicago Manual of Style Q&A. Really. The manuscript editors from the University of Chicago Press have been answering style questions online for more than ten years. Why, that was two stock market bubbles ago! And throughout they seem to have kept their sense of humor: Q. My colleagues are divided in their opinions about “storing data in a computer” versus “storing data on a computer.” Which is correct? Thanks. A. You can do either, but I would store the data in the computer. It used to be easy to store stuff on a computer, but now with flat screens and laptops it tends to slide off. 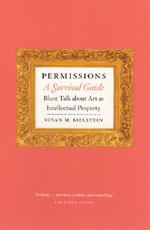 Read more on the CMOS Online website. . . .
Eugene G. Schwartz offers an excellent review of Susan Bielstein’s guide through the labyrinthine world of visual image copyright law, Permissions, A Survival Guide: Blunt Talk about Art as Intellectual Property, for his latest posting on ForeWord magazine’s Publishing Matters blog: Before the internet, and especially before desk top publishing, you pretty much had to work with physical copies of things.… This imposed a variety of practical barriers that kept the leakage of rights to a minimum and concentrated its more substantial flow in the hands of professional thieves. All of that has changed—and with the low cost and ubiquity of scanners, cell phone cameras… gate-keeping the rights of images is like keeping a safe deposit box in a room with an open window. Nonetheless, the publishing industry still relies on copyright law as the foundation of its economic viability. As all who read ForeWord well know, publishers have struggled to cope with establishing rights in an electronic world, and authors and agents have been pushing back while warily going with the flow. All of this leads to a book I’d like to recommend to any of you who are interested in the subject, and especially if you deal . . . 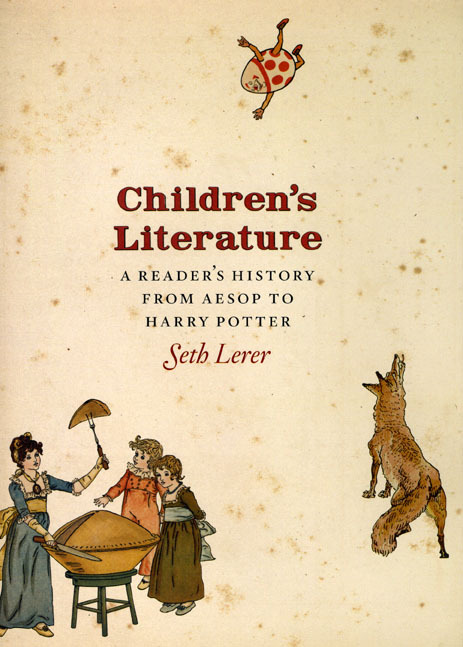 In Children’s Literature: A Reader’s History from Aesop to Harry Potter, Seth Lerer tells us the bedtime story of Western culture’s obsession with books for the young. He traces the transformative power of literature across centuries, from the moralizing allegories of antiquity to the swashbuckling epics of the nineteenth century and the acerbic self-awareness of Judy Blume and Weetzie Bat. Written with the panoramic scope of a distinguished scholar and the affection of a parent and avid reader, Children’s Literature reminds us of the sublime power of books in an era when videogames, MySpace, and text messaging compete for the free time of our youth. Read the press release. . . .